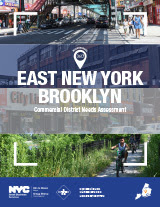 We are thrilled to share the release of the City of New York’s Commercial District Needs Assessments (CDNA’s). These six neighborhood assessments set a tremendously high bar for the kind of information that government entities can collect and share on behalf of local communities. The assessments give neighborhoods a powerful tool that they can use to encourage investment and advocate for the improvements they want and need. They allow neighborhoods to communicate not only strengths, but also make clear the kinds of enhancements that are needed to improve quality of life and business opportunities for both residents and businesses alike. Our connection to this project is quite personal. Over a year ago, the New York office of the Local Initiative Support Corporation provided funding for our firm, Larisa Ortiz Associates, to develop the framework for what eventually became the CDNA approach. In coming months we will be working with LISC to turn the methodology in a practical ‘how to’ manual so that other communities can benefit from – and perhaps even replicate – the approach. Adminstrative capacity – which reflects the organizations, institutions and local leaders whose engagement is critical to the success of commercial revitlaizaiton efforts. This approach results in a much more comprehensive profile of opportunities and needs – and helps put communities behind the steering wheel when it comes to advocating for the investments that they want and need. We couldn’t be more excited to share this with the field. Congrats to the amazing team at SBS for the hard work that went into creating these wonderful tools! To download the assessments and to find out more about the great work that the Department of Small Business Services is doing click here.